No race car is complete without a sweet graphics package. We were a bit surprised at how cheap it is to make your car look awesome. 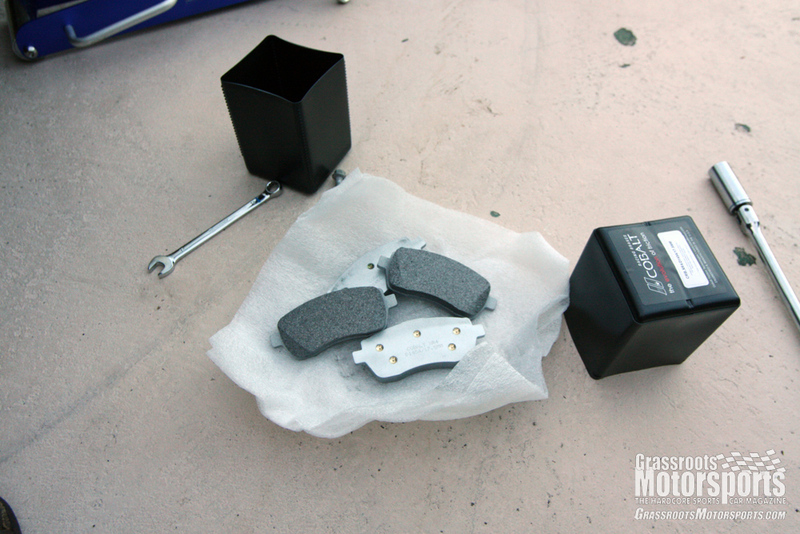 We installed a set of Cobalt XR4 brake pads. They're rated to work well down to 50 degrees Fahrenheit, so they make a perfect autocross pad. Relocating the rear springs from the coil-over location to the original spring perches was required by SCCA's STF rules. 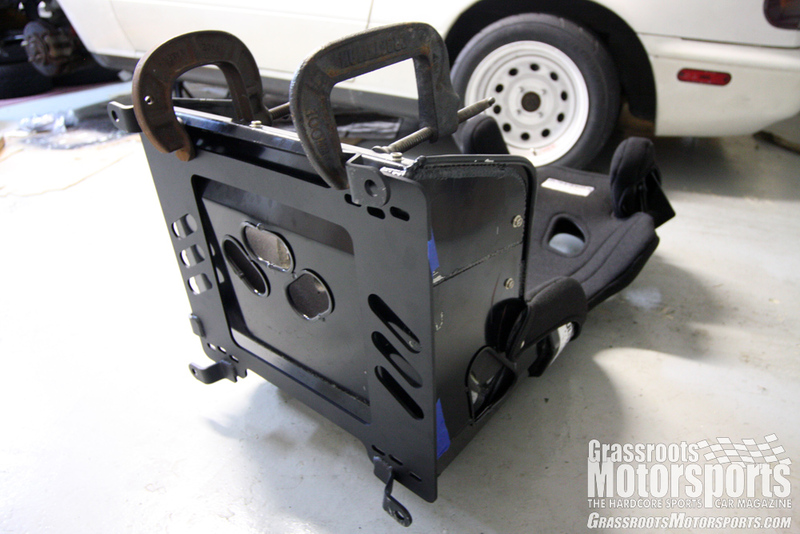 A Planted seat adapter let us install our Ultrashield seat with ease. We sent a scalable vector illustration to Hawkeye Brothers, and they made up these big vinyl cuts for less than $80 per side. Crunch time: We’re leaving for the SCCA Solo Nationals soon, and we had to make some final preparations. First, our front brake pads were cooked from our many track days and autocrosses. These OEM pads survived for about 14,000 miles under our heavy abuse before being worn to nothing. We installed a set of Cobalt Friction XR4 pads. They’ll work well down to 50 degrees Fahrenheit, so they’re perfect for autocross and some street use—though they do squeal a bit around town. While we were swapping pads, we also installed a set of Goodridge stainless steel braided brake hoses, and, of course, bled the whole system. 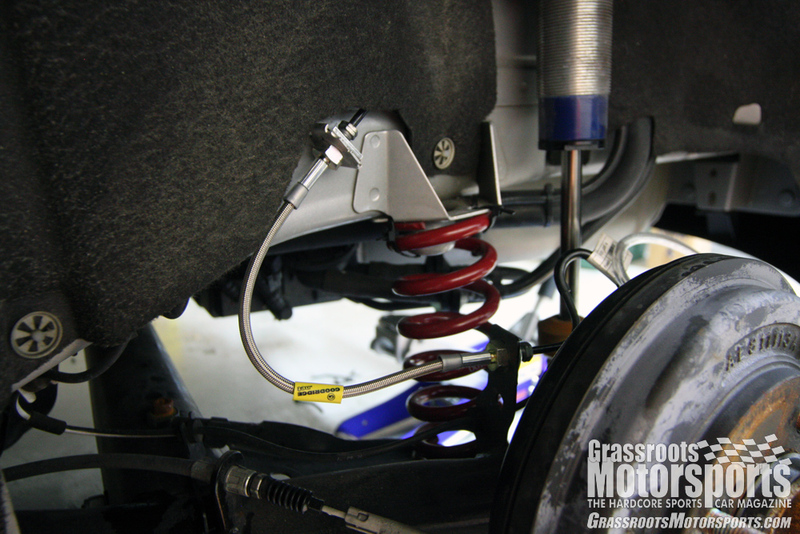 Our Ford Racing B-Spec coil-over suspension kit relocated the rear springs from the twist beam to the shock body. The SCCA’s STF-class rules require that the spring’s mounting locations not change, so we had to take the springs out and stick them on the twist beam. Zip ties keep them from falling out when the suspension goes full droop. Of course, we also needed a proper racing seat. We put in a call to 425 Motorsports and ordered a Planted seat bracket. This made installing our Ultrashield seat a much easier job. It lines up with the holes in the floor and gives us a good sturdy surface to bolt our seat to. It even has a mounting point for the OEM seat belt, which is handy in a car that doesn’t yet have a harness. 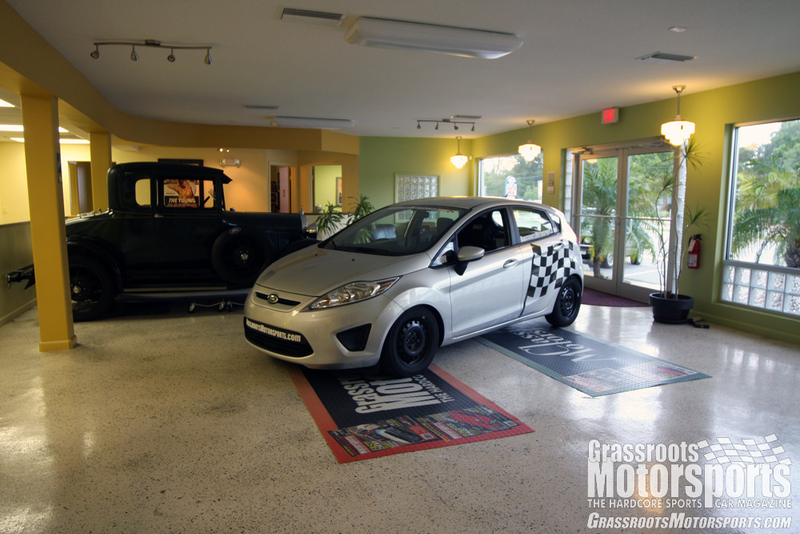 That setup weighs 10 pounds less than the original Fiesta seat. No car is complete without stickers. We sent a design over to Hawkeye Brothers along with some measurements, and for about $80 per side we had a pair of cut vinyl decals done to make it look awesome. Finally, we had to get a pair of street tires for the long drive. A pair of our OEM Kumhos were completely done, and our new Toyo R1-R rubber was already down to the wear bars, thanks to our plethora of track tests. The Toyos will be fine for the week of Nationals, but not do drive all the way to Nebraska. We visited a local used-tire shop and replaced the two worn Kumhos with some old Goodyears. They’ll get us to Nebraska and back with the Toyos in the trunk. It’s a party at the track and everyone’s invited. Subscribe now for tons of sports car content delivered 8 times a year. Nice checkered flag...where did THAT come from? >>;=) I hope y'all add your "patented" red lettering in front of the checkered flag for the race. OK, at least it's prob (c)! I'm a photographer so whatever looks good, I'll shoot it, be it SCCA w/ my friend's Formula Monster or pretty much every car fr Summit down to Reobling or Road Atlanta or anything on 2 wheels like tmrw's AMA Superbike Sooooperetc race @ NJMP to whatever looks sweet. IMHO the logo grabs more eyes aka subscriptions than simply the web logo on the front bumper. I've only been reading since I saw the $1500 Challenge on the news stand @ Virginia Tech. Also, nice lineage pic w/ the Model A in the background. My grandma owned one eons ago. In fact, she was basically the 1st woman on Wall St. I hope CMS adds some sticky tires to it, and perhaps some aftermarket rims since the stock ones were wooden.